Thursday night was a huge night for London in the fashion calendar. Vogue's Fashion Night Out was only 4 years old this year and is basically a night to celebrate shopping. Pretty cool, hey? It centred around the designer shops in Bond Street but being a big fan of the high street that I am, I just stayed on the old faithful Oxford Street. I wore this cut out shoulder dress from Topshop that I grabbed in the sale for £20. 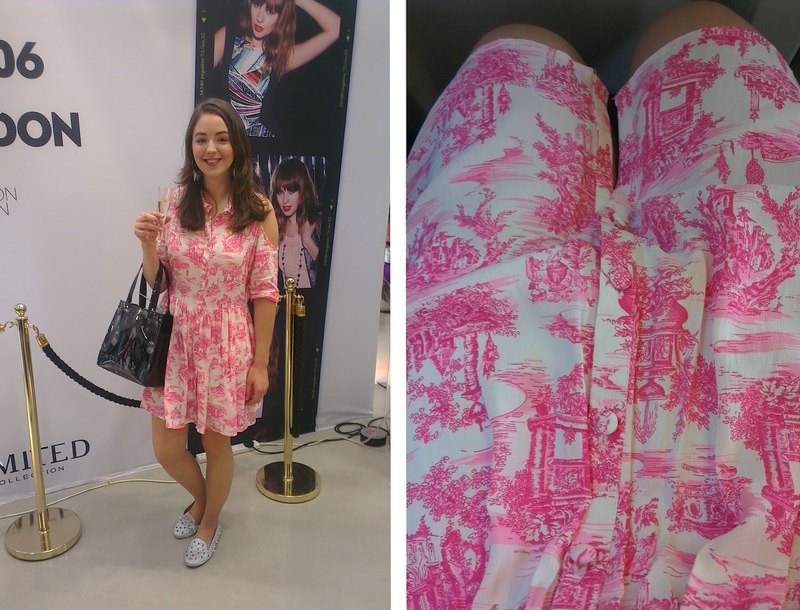 The chandelier print bag is Ted Baker which I managed to win last week on ebay for only £8! The spike shoes are also ebay and the spike earrings are H&M. 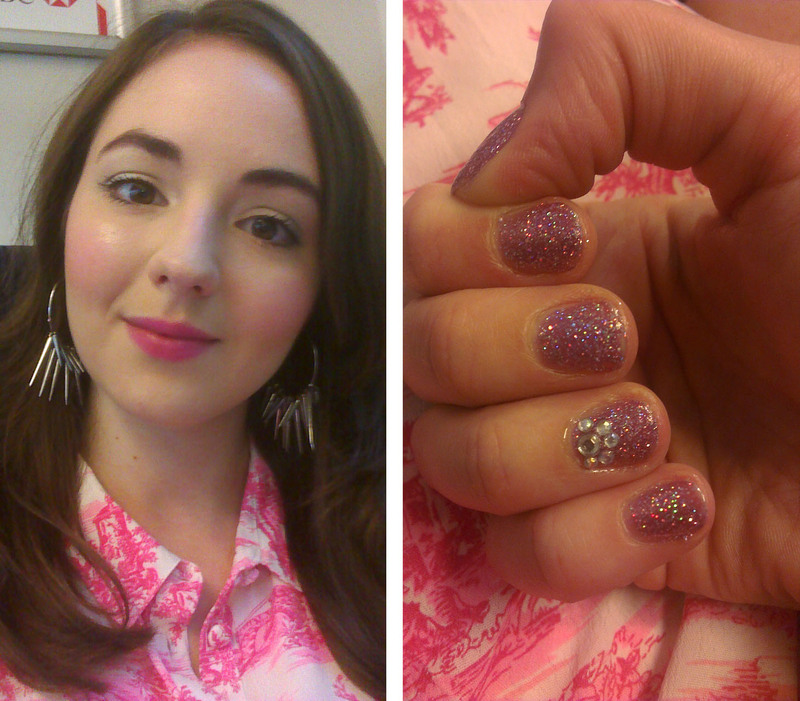 Miss Selfridge hosted a whole load of free events including this manicure (which you got to book so no queuing yay! ), which was supported by Bourjois. This gorgeous holographic polish is called 'rainbow apparition' and I'm definitely going to pick it up! I spent most of the night dotting around the stores aiming for the free drinks rather than shopping and so only ended up buying a belt for £4! House of Fraser were definitely giving away the best drinks courtesy of Mahiki - cocktail in a coconut, amazing. 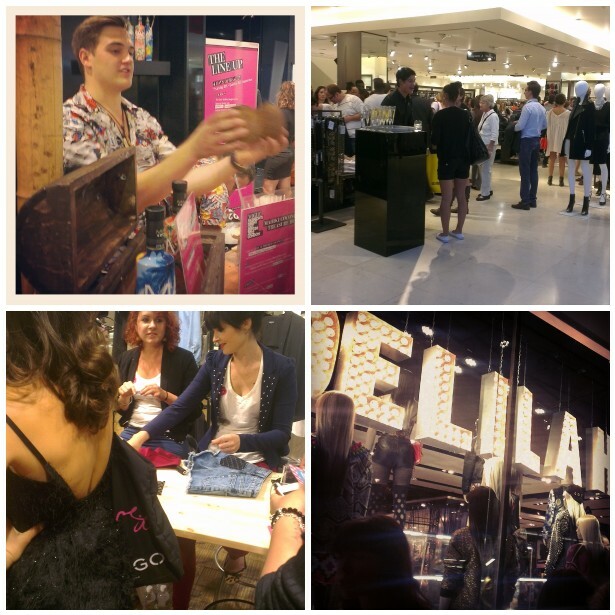 Mahiki coconut rum bar, champagne in Zara, customizing workshop in Miss Selfridge, Delilah performing in Topshop. Even though it was busy the streets were humming with a positive fashion vibe (probably all the free alcohol.) DJ's were playing in most stores including fellow blogger Zozo from the London Lipgloss in Forever 21, and the gorgeous Laura Whitmore in River Island. I thought it was fantastic the lengths every store went to to engage their customers, I even heard one confused shopper say, "is every Thursday like this?" - I wish! Bring on next year! Love the dress - really suits you! And ahhh I wish every Thursday was like that! There was such an amazing atmosphere!